what a fantastic recipe! i love that you used lentils instead of tvp/tempeh/seitan. i will definitely have to make this recipe! Delicious! My daughter is allergic to potatoes (I know! Who is allergic to potatoes? ), so we subbed half a large turnip for the filling and sweet potatoes to make the topping. We really enjoyed it! Thanks! Another great soy-free dish!! This recipe does contain soy. It is soy sauce and soy milk. I’m sure you can eliminate it or add something else to replace it and still be delicious. In the first paragraph you say to put something in a pot and to caramelize for 45 minutes. Do you mean the onions and do you mean 4 – 5 minutes? This is a great idea for a recipe. My kids love lentils and while we’re not vegetarian and I’ll probably make it with dairy I think it is a great veggie option for us to add to our weekly menu. Michelle, sorry I left out the word onion in the directions. I also should have been more specific about the cook time. It is 45 minutes because I want the onion to cook for a long time to develop a deeper flavor. Marlene, thanks for your concern — I used rice milk instead of soy and coconut aminos instead of soy sauce. This dish is called Farmer’s Pie. 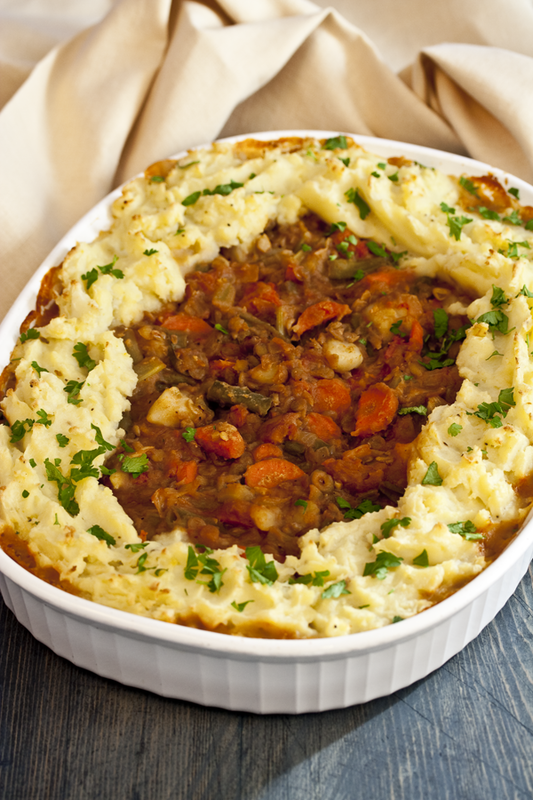 Shepherd’s Pie has LAMB in it, hence the name. No, this is not a farmer’s pie, it’s a VEGAN version of Shepherd’s Pie that DOESN’T have lamb in it, hence the name VEGAN. Do you think this will taste good with the cheese sauce that goes with the eggplant Parmesan. I have some left over and want to try it with this. A divine vegan sheperd’s pie! Looks truly appetizing & fab! Mt family loves this recipe. It was a little sweet the first time so I leave the sugar out now and they cant get enough. The texture is great and it is hearty and “meaty” without the meat. This had become one of my favorite recipes since becoming Vegan. What a fantastic recipe!! Only made minor changes – replaced soy milk with rice milk, put in a full cup of celery and used red lentils and could not find the ‘liquid smoke’. Wow, this dish was an absolute hit. This will be a weekly favorite for during the winter, here in Brisbane. Why is it so high in sodium. I would use low sodium soy sauce but I don’t think that will bring it down to an acceptable level. The revipe looks greay excrpt for thesodium. Any suggestions? I’ve been making low carb shepard’s pie with cauliflower instead of potatoes. I’ll try that with the vegan version for a new twist. My family members are omni and picky, but I can rely on your website for recipes that even they love. Made this today and it was a hit! Makes me happy that I can feed them something that they enjoy and is also healthy for them. Thank you! I have been making this recipe for Thanksgiving since 2012 and it is ALWAYS a hit. It is easy to make and such a comforting, hearty meal for thanksgiving. I am vegan but no one else in my (large) family is and this dish is always a huge hit!